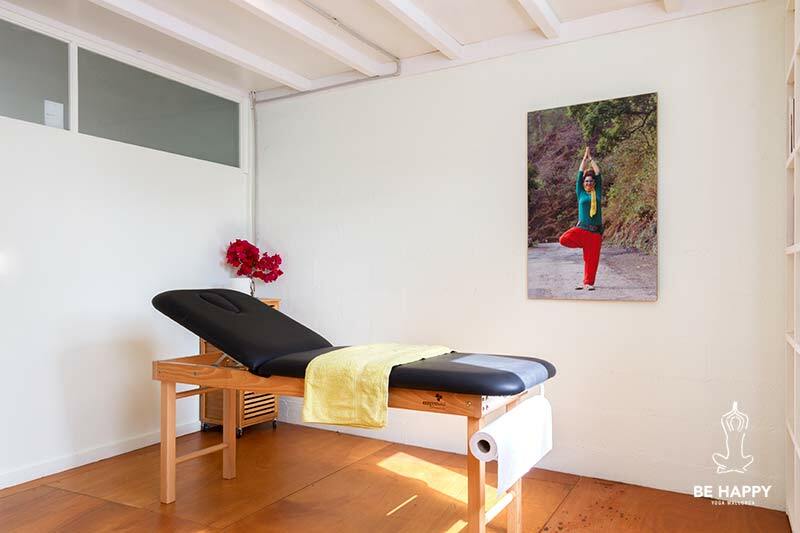 The Be Happy studio is a space for personal growth, a family project, undertaken with the aim of opening a centre for all those who awaken the curiosity of knowing oneself, to devote time to care for their body, cultivate and educate their mind. A priori and for many years the study was the graphic Study-Workshop of the Maior Gallery, space which the gallery used to give to its artists to make their mark, experiment and create works that are now part of the Maior editions. This project was already at the time, an initiative driven by Amador. 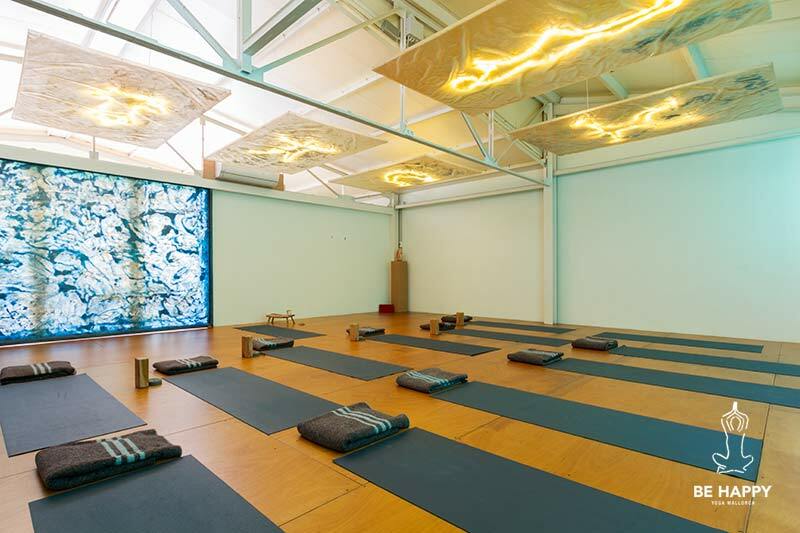 In hindsight and after the changes brought about in the world of art, and curiosities awakened in the small family, after their trip to India to formalize their yoga studios, they propose to give life back to that wonderful space. Amador, an artist with great experience and known for his facilities, turns entirely on the reconstruction project of the space, creating a sky of illuminated asanas (postures), retaking the concept of the work The Temple of Cel, presented in various museums ( cloister Santo Domingo, CAC Malaga, Zurich …) down to the last detail and making it an authentic temple of meditation, relaxation and yoga. The studio is very light and well acclimatized. 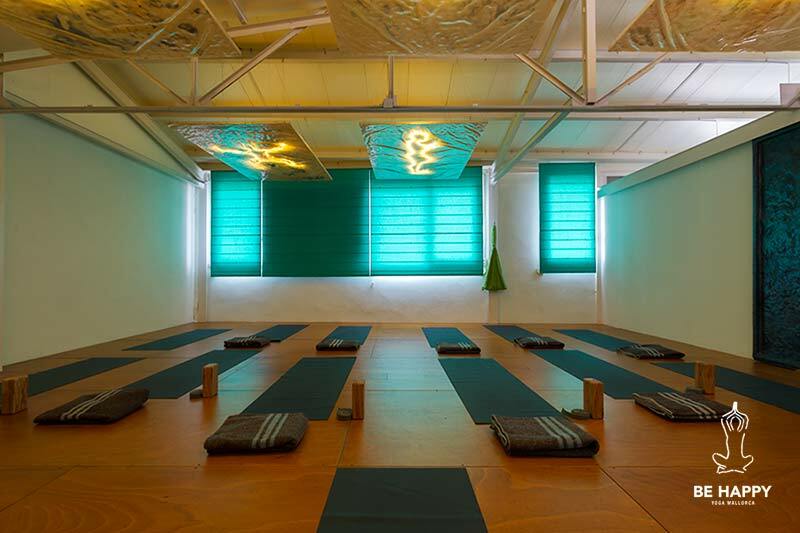 It has a large room where yoga classes are held,two small massage rooms where different types of alternative therapies are practiced, a dressing room, a lounge for tea with kitchenette, an outdoor terrace, and an organic garden where we harvest fruits and seasonal vegetables combined with aromatic plants that help maintain the garden 100% natural. 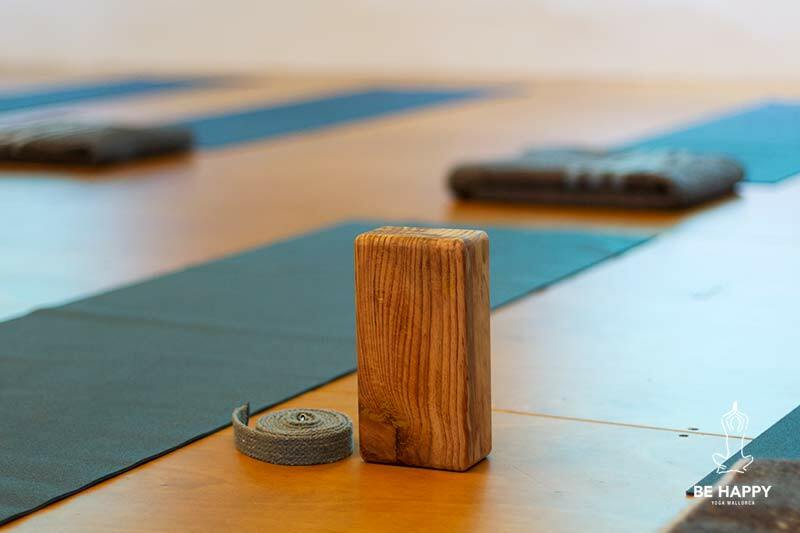 We have specific mats for practice, which are treated with tea tree, a natural disinfectant which helps us maintain the hygiene of these and provide greater adherence. 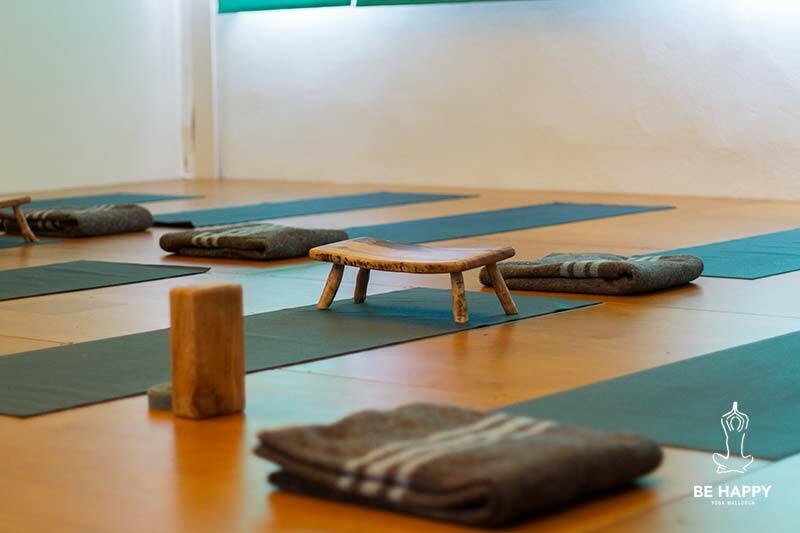 Yet for reasons of hygiene and comfort, we recommend having your own mat.  We have also designed postural correction cushions ideal for use during savasana (final relaxation), which help us open the chest and relax the lower back and legs, areas normally affected by our day to day at the office or by standing hours on end. We have bands and wooden blocks to adjust positions to everyone’s individual needs. At Behappy study, we attach great importance to the alignment of the spine during the execution of the asanas (postures), often the most important thing is not reaching the ground or feet with your hands, but knowing how to adjust posture, with a block or tape if necessary, to lengthen and stretch the spine, which is what we are really looking for in practice, providing space to the body to release tension and blockages, providing health and general wellbeing. 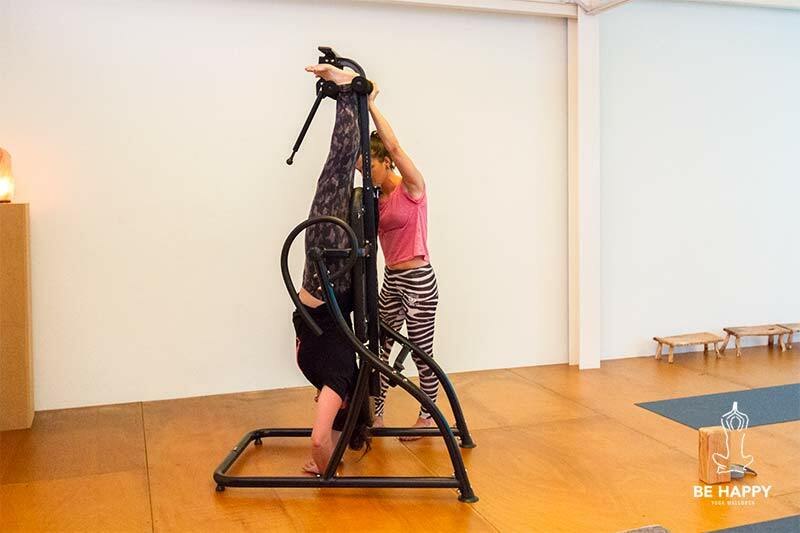 As a star piece, we also have an inversion table, ideal for everyone and especially for those who for various reasons can’t execute inverted postures or suffer from severe pain in the back (especially lumbar and cervical area). In addition to give us all the benefits of an inverted posture, it is considered the most effective support to combat problems and backaches. It works with the force of gravity, putting our body upside down, decreasing the spinal pressure automatically, freeing the lower back and the entire back in general and without bearing the weight of the entire body. It provides space between the vertebrae, oxygenating cartilage and repositioning the whole spine, relieving and relaxing muscles in the affected areas. 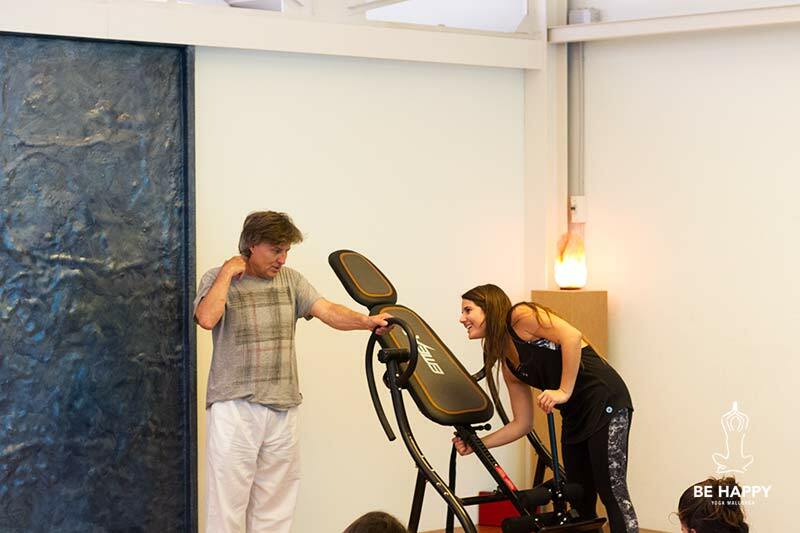 Furthermore, this exercise increases blood flow providing improved circulation thus benefiting all parts of our body, experiencing a change of total fluid, cleaning and oxygenating the body. It is well acclimatized and equipped with heated massage table and various accessories (towels, paper, oils …).